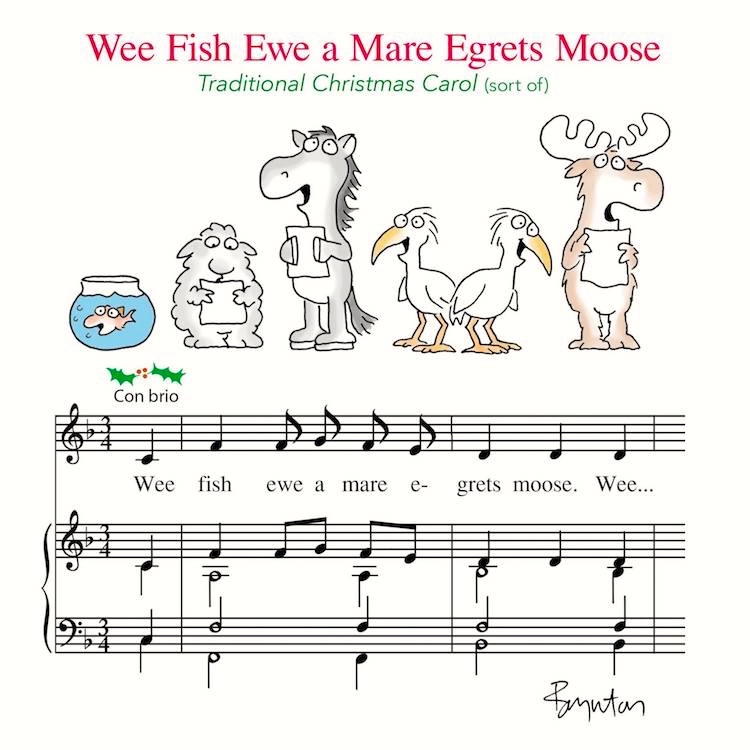 First, season’s greetings from the person responsible for “Hippo Birdie Two Ewe(s)!”. Then, a duplicitous stop-motion animation penguin bearing gifts. In the case of homophonic translations [bilingual “Mots d’Heures, Gousses, Rames” for “Mother Goose Rhymes”, monolingual “Ladle Rat Rotten Hut” for “Little Red Riding Hood”], the “translation” is more like word-for-word substitution based on phonological similarity than like ordinary semantically based translation, and the word-to-word relationship is not full homophony but something more like the imperfect puns in jokes, which are often quite distant phonologically. And on Boynton’s “Happy Birthday” burlesque, see my 12/8/14 posting “Fur tree”, about Boynton; in #2 there. two variants of her “Hippo Birdie Two Ewe(s)”. I believe this is Feathers McGraw, the felonious individual from The Wrong Trousers. Beware! 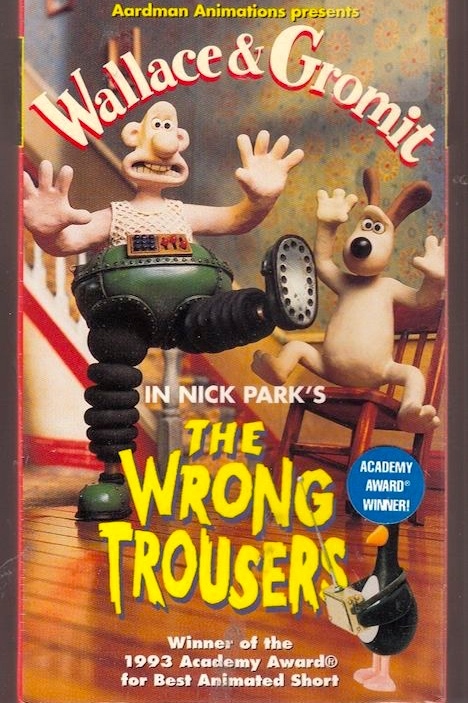 The Wrong Trousers is a 1993 British stop-motion animated short film directed by Nick Park at Aardman Animations, featuring his characters Wallace and Gromit. It is the second film featuring the eccentric inventor Wallace (voiced by Peter Sallis) and his dog Gromit, following A Grand Day Out (1989). 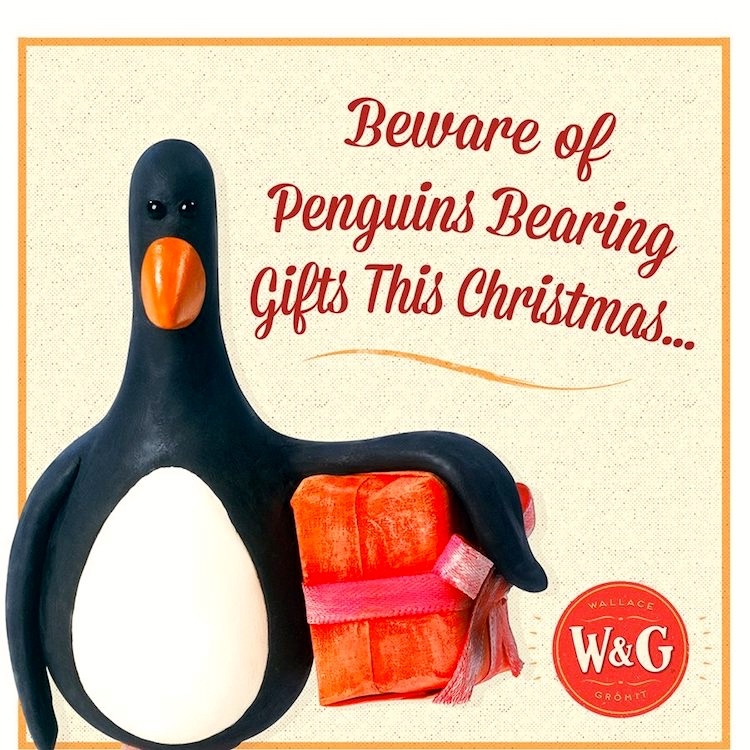 In the film, a sinister penguin uses Wallace and Gromit’s robotic “Techno Trousers” to steal a diamond. … A sequel, A Close Shave, was released in 1995. … Wallace decides to advertise the spare bedroom to let. The room is taken by a penguin, who befriends Wallace and isolates Gromit. The penguin takes an interest in the techno trousers after seeing Gromit use their suction feet to walk on the ceiling while decorating. After Gromit is driven from the house, the penguin secretly rewires the techno trousers for radio control. 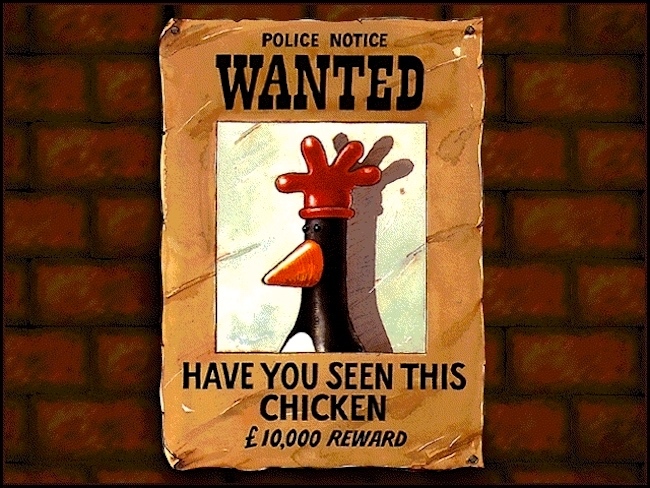 While Gromit hunts for lodgings, he discovers a wanted poster offering a reward for the capture of a criminal chicken by the name of Feathers McGraw. In fact, the “chicken” is the lodger penguin, who disguises himself by wearing a rubber glove on his head. Wallace’s morning routine is interrupted when Feathers replaces his clothes with the techno trousers, and tires him out by sending him on an extended test run through town. Later, Gromit spies on Feathers as he takes measurements of the city museum. Returning home, he discovers Feathers’ plans to steal a diamond from the museum. While Wallace sleeps, Feathers marches him to the museum and uses the trousers to infiltrate the building. He uses a remotely-operated crane claw, contained in a helmet he has made Wallace wear, to capture the diamond, but triggers the alarm, waking a panicked Wallace. Feathers marches him back to the house and traps him and Gromit in a wardrobe at gunpoint. Gromit rewires the trousers to break open the wardrobe. He and Wallace chase Feathers aboard their model train set. Wallace disarms Feathers and frees himself from the trousers. After Feathers’ train collides with the trousers, Gromit captures him in a milk bottle, and he is later taken to the police, who imprison him in a city zoo. Wallace and Gromit celebrate paying off their debts with the reward money while the techno trousers, consigned to the dustbin, walk off into the sunset. This entry was posted on December 22, 2018 at 12:49 pm and is filed under Holidays, Language play, Linguistics in the comics, Movies and tv, Music, Parody, Penguins. You can follow any responses to this entry through the RSS 2.0 feed. You can leave a response, or trackback from your own site.